This post is written by Jennifer Poleon, Digital Communications Manager for the Columbus Museum of Art. You can follow the Museum on Twitter @ColumbusMuseum . 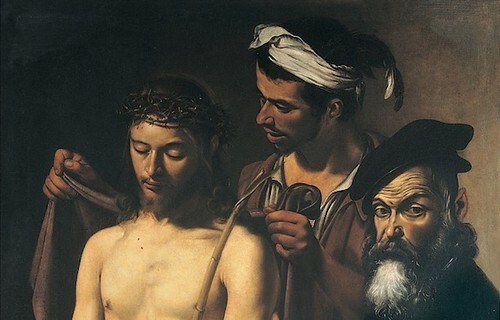 In honor of the Columbus Bicentennial and our relationship with our sister city Genoa, Italy, our exclusive Caravaggio: Behold the Man exhibition featuring the Ecce Homo painting remains on view through February 12, 2012 . This is your last week to take advantage of this rare opportunity to see the Italian master’s work up close. Caravaggio’s works are quite rare, as in his short life the Italian master only painted about 80 known works. Our Curator of European Art Dominique Vasseur reflects back on what it’s been like to host such an important exhibition. As Curator of European Art, what are two of the most exciting things about having the Ecce Homo in Columbus? The opportunity to host an internationally-known painting by Caravaggio from Genoa, our sister city, and the ability to share with our visitors this artist’s amazing impact upon European painting in the early 17th century. The exhibition has attracted everyone from young art students to clergy members. What is it about Caravaggio that appeals to such a wide audience? Caravaggio’s realism and ability to address the human condition are as true today as during his lifetime. Students may be drawn to the immediacy of his painting technique, as well as, the stories of his turbulent life. Members of the clergy—both Catholic and Protestant—are likely moved by the poignancy of this important moment in Christ’s passion and the sensitive manner in which Caravaggio depicts it. What is the most memorable moment of the exhibition for you? There are many actually, but I have to share my top four: my November 2010 meeting in Genoa with the director of the Musei di Strada Nuova to see and discuss the Caravaggio; the morning of Sunday, October 16, 2011, when we un-crated and installed the Ecce Homo here; our Media/VIP preview the evening of October 19, which was a great success; and finally the lecture presented here on November 12 by Italian scholar Lorenzo Pericolo, who had just published an important and scholarly book on Caravaggio. In it he thoroughly discusses the Ecce Homo and presents several fascinating new theories about the unusual figure of Pontius Pilate. What about the exhibition were you most proud of? I am very proud that Columbus was able to organize this special, focus exhibition as a way to begin our 2012 Columbus bicentennial celebrations, as well as the fact that all the major art museums in Ohio (Cincinnati, Cleveland, Dayton, Oberlin, and Toledo) so generously lent Caravaggesque works to support the thesis of the exhibition: “the impact of a revolutionary realist.” It was immensely gratifying.